Ron Smith is one of six Hawick councillors no longer facing the threat of having to vie for four seats. The Scottish Government’s rejection of proposals to cut the number of Hawick councillors and Scottish Borders Council wards has been hailed as a victory for common sense. Among a range of recommendations put forward by the Local Government Boundary Commission for Scotland was a plan to cut the council’s tally of elected members from 34 to 32, with both the seats facing the axe being in Hawick. However, this week’s decision by ministers at Holyrood means the commission’s proposal to replace Hawick’s two three-member wards with one four-member ward will not go ahead, and the current arrangement will remain in place for next year’s local government elections. Hawick and Hermitage councillor Ron Smith, also the council’s executive member for planning and environment, said he was delighted the Scottish Government had recognised the importance of local democracy in the Borders and supported the local authority’s plea to be allowed to retain all 34 elected councillors. “Scottish Borders Council has consistently argued throughout the boundary commission’s review that councillor numbers should not be reduced, while members of the public have also strongly made their feelings known on this matter,” he said. His fellow Hawick councillors agreed that the decision was good news for Hawick and the rural communities surrounding it. Hawick and Denholm representative Watson McAteer said: “We have met with Scottish Government ministers and lobbied hard to over-turn the position the council had agreed that would have seen two councillors disappear and a new single Hawick and district ward. Fellow Hawick and Denholm councillor Stuart Marshall commented: “This was a heavily loaded fight against all the odds, but pure persistence and determination by many people have won the day, and I warmly welcome the Scottish Government’s decision. “We heard on many occasions that we were wasting out time and that this was a done deal, but the lesson is simple –never give up when you know you are right. It was back in May that the boundary commission published its final recommendations for new local authority boundaries. The proposals for the Borders were for the local authority to have two fewer councillors and for the Hawick and Denholm and Hawick and Hermitage wards to be merged into a single Hawick ward. Denholm and Bonchester Bridge would have formed part of a new Jedburgh and district ward. Hawick and Hermitage councillor David Paterson believes common sense has prevailed, saying: “I’m absolutely delighted that commonsense has prevailed in the end and the minister has listened to the many concerned people in the Hawick and Hermitage ward and the Hawick and Denholm ward that they wanted to retain their historical links with Hawick. 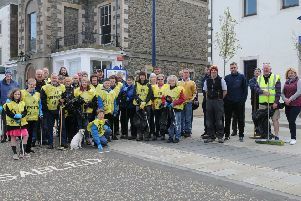 Fellow Hawick and Hermitage councillor George Turnbull added: “This is fantastic news for the whole of the Scottish Borders, and in particular to Hawick, retaining the two wards of Hawick and Hermitage and Hawick and Denholm. “The campaign to keep all 34 Scottish Borders councillors, which was fought from all quarters, was significant, and I and others are very pleased that the minister took on board the ramifications that would have followed if the councillor numbers had been reduced within the Borders. Hawick and Denholm councillor Alastair Cranston says the decision underlines the importance of current councillor numbers for an area such as the Borders with a large dispersed mainly rural population. “Country wards are different from cities, with more numbers of active community councils assisting local governance and local business development, including, in our specific part of Scotland, a potentially growing Borders tourist industry,” he said. Ettrick, Roxburgh and Berwickshire MSP John Lamont had strongly criticised the proposals and is glad to see them being dropped, saying: “It was my view that the proposals from the commission would have been damaging for Hawick because they would be reducing the town’s voice at a time of significant economic challenges.